This entry was posted in America, Current Events on January 8, 2011 by Michael Happy. Palin would clearly like images like these to disappear down the memory hole. You won’t find them at any of her sites after today. This suggests a guilty conscience. Because if they really didn’t have anything to do with today’s murderous assault (which will no doubt be the endlessly repeated talking point), then why must they be made to disappear? Today is David Bowie’s 64th birthday. Here’s approximately 40 years worth of music. Even this small sample reveals an enviable body of work, and everybody will have reason to complain that a personal favorite has been left out. Mine include “Is There Life on Mars?” and “Oh, You Pretty Things” from the early period, and “Afraid of Americans” and “Thursday’s Child” from the late. But the one song that continues to amaze me is “Golden Years.” It was recorded in 1975 but could have been released at just about any time over the past thirty-five years and still sound like it was being served hot. The leavening agent of pastiche is about as fully realized here as it ever is in Bowie: doo wop background vocals performed with skin tight harmonies, Prussian-disciplined finger-snapping and hand-clapping to tease out the syncopated funk rhythms, three stray grace notes produced by what may only be programmed to sound like a harmonica, and Bing Crosby-like whistling in the outro. Does anybody else know how to collate such vagrant elements into a song that you also want to dance to? Plus he wrote the heartbreaking “All the Young Dudes” and then gave it to Mott the Hoople to render as the life-affirming anthem for those who still retain the ambition to carry the news. This entry was posted in Birthdays, Popular Culture on January 8, 2011 by Michael Happy. Congresswoman Gabrielle Giffords is dead is in critical condition. Others are reported to have died, including a nine year old girl. 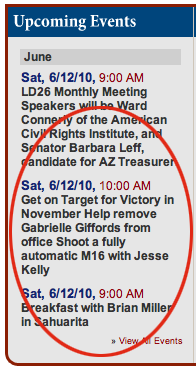 Above is a campaign notice from Giffords’s Tea Party opponent last summer. Andrew Sullivan is live-blogging on developments here. Democratic Congresswoman Gabrielle Giffords was shot in the head today in Tuscon. At least eleven others were injured. It may be that five of them, including the congresswoman, have died. 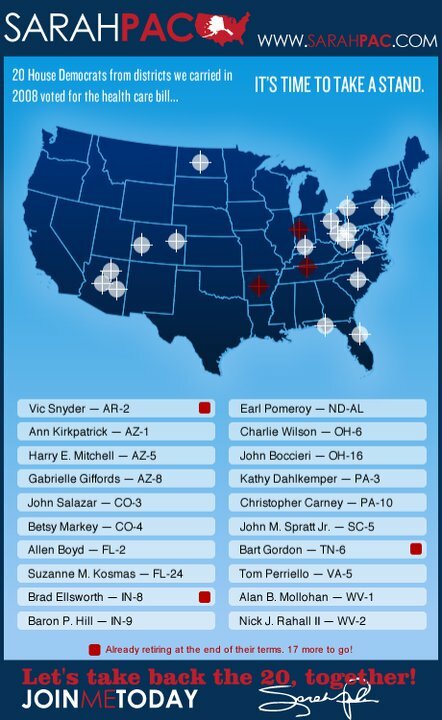 When the graphic above was released by Sarah Palin’s political action committee last year, it caused a stir, and it’s not difficult to see why. The political “targets” here are literally in the cross-hairs. Today one of them was targeted for assassination. The eliminationist rhetoric of the right is not new. It’s been around for a while, and it was just a matter of time before someone decided that it is not merely a figure of speech. “Traitors” get what’s coming to them eventually. 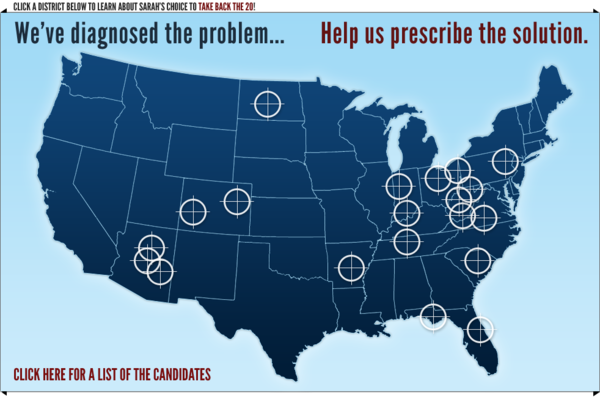 What is most disturbing about the Palin graphic is how she personalizes it — “Join Me Today.” That’s not an abstraction. That’s a cult of personality with a more or less open agenda for violence. So, okay, Sarah. We’re going to hold You accountable. Not that it will likely make much difference. Advocates on the far right have been laying the groundwork for this day by repeating for months now that the “left” will be responsible for any occurrence of violence because it has been baiting its antagonists. Glenn Beck has said so explicitly and repeatedly — he did so as recently as yesterday. Everyone will scramble to deny this, and just enough people will buy into the denial. I’m calling this one in the air: those most guilty of this egregious behavior will produce pious statements of sadness while denying that their words are in any way responsible. Within the week Fox News will be asking some form of the question, “Did the Democrats bring this on themselves?” Any effort to link the assassination to violent rhetoric on the right will be drowned out by escalating squeals of indignation. At this point, the script just about writes itself. We already know how this goes. Today is Stephen Hawking’s 69th birthday. The stars lined up nicely this week to provide opportunities to consider the relation of myth to science. Hawking’s birthday is a good way to cap it off. Here are three quotes from Frye on cosmology collected in Bob Denham’s Northrop Frye Unbuttoned. Cosmology is the process of assimilating science into a mythology. It’s always temporary because it’s always wrong–that is, it’s full of fictions. The use of mythical analogies to scientific principles (evolution, relativity, entropy, indeterminacy) is cosmological. Note that contemporary poets can still deal with phases of the moon, the four elements, even the word “universe”–in short, with out-of-date cosmologies–because cosmology, like mythology, comes eventually to speak the language of imagination. The objective cosmos usually tends to think in terms of a development from chaos to creation and order, from the simple to the complex, from fortuitous collections of atoms of like attracting like. The imaginative cosmos, on the other hand, thinks in terms of a past Golden Age or a lost Paradise, because it naturally starts with an ideal or model in the mind, of which the present situation is a degenerate form. Actually, this does not quite round out the theme for the week. Today is also the birthday of David Bowie, whose apocalyptic imagery is often space-based: from “Space Oddity” to “Is There Life on Mars?” to “Ziggy Stardust” to “Moonage Daydream” to “Starman” to “Ashes to Ashes” to “Loving the Alien.” A selection of Bowie videos later today. This entry was posted in Birthdays, Cosmology on January 8, 2011 by Michael Happy.